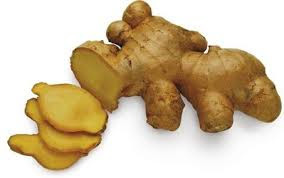 Ginger root should be kept in a cool, dry place, usually at 40 to 45 degrees Fahrenheit. After purchasing, ginger may be refrigerated in plastic wrap for up to one week. For longer storage, peel ginger root and cover it with sherry wine before refrigeration. Freezing for up to three months is also an option. Gingerroot is characterized by it’s strong sweet, yet woodsy smell. It is tan in color with white to creamy-yellow flesh that can be coarse yet stringy. Ginger is an excellent natural remedy for nausea, motion sickness, morning sickness and general stomach upset due to its carminative effect that helps break up and expel intestinal gas. Ginger tea has been recommended to alleviate nausea in chemotherapy patients primarily because its natural properties do not interact in a negative way with other medications. It is a safe remedy for morning sickness, since it will not harm the fetus. Some studies show ginger may also help prevent certain forms of cancer. To make ginger tea, slice some ginger root, put it in a tea ball and place in a teapot. Pour boiling water over the tea ball and let it sit for ten minutes. Sweeten with honey or drink it straight. In spite of it being a natural remedy, it's important that any medicinal use of ginger be discussed with a physician, as it must be taken in moderation to avoid gastric irritation. Ginger is available year-round. When selecting gingerroot, choose robust firm roots with a spicy fragrance and smooth skin. Gingerroot should not be cracked or withered. It can be stored tightly wrapped in a paper towel or plastic wrap (or put into a plastic bag) in the refrigerator for 2–3 weeks and like galangal, gingerroot can also be placed in a jar of sherry and refrigerated for 3–6 months. The aromatic rhizome of this 30 – 60 cm tall tropical plant is used in food preparation and as medicine for centuries in southeastern Asia. There, pharmacists recommend it for any ailment with which people may be afflicted. Ginger grows in southern China, Japan, West Africa, and many other tropical countries including the Caribbean islands. Jamaican ginger is considered to be the best of all. Chinese cooks use ginger with beef successfully, whereas European chefs prefer to use it as an exotic flavouring for fresh fruit salads, or to give cream of carrot soup and extra kick. English make candied ginger, ginger jam, and dry it to be ground and use as a condiment. Chinese dry ginger and sell it as green ginger. Black ginger is first scalded and then dried. Fresh ginger is best. Its thin skin can be scraped with the back of a spoon and then cut, grated or pounded to mix into soups, sauces and stews. Ginger possesses an intriguing; sweet, spicy and pungent flavour rendering it suitable for use in a range of dishes from stir-fried beef to ginger tea. Ginger ale, ginger beer and ginger wine are only vaguely flavoured with ginger. The major producers of Ginger today are China and tropical/subtropical places in Asia, Brazil, Jamaica, Nigeria.